Twin Lobe Blowers, also commonly known as Positive Displacement Blowers (or PD Blowers) are available for flow rates ranging from 14-cfm to 5,900-cfm in single stage and up to any capacity in parallel configurations, for working pressures up to 14.2-psi. As previously mentioned, TWIN Lobe Rotary Blowers belong to the category of Positive Displacement Blowers. They consist of a pair of involute profiled (shape of 8) lobes/rotors rotating inside an oval shaped casing, closed at ends by side plates. One lobe is the driving lobe, which is driven by the external power while the driven lobe is driven by a pair of equal ratio gears. Both the lobes thus, rotate at same speed but in opposite direction. As the rotors rotate, air is drawn into the inlet side of the cylinder and forced out from the outlet side against the system pressure. With each revolution, four such volumes are displaced. The air, which is forced out, is not allowed to come back due to the small internal clearance within the internals of the machine except a very small amount called ‘SLIP’. There is no change in the volume of the air within the machine but it merely displaces the air from the suction end to the discharge end, against the discharge system resistance i.e. no compression takes place in the machine. 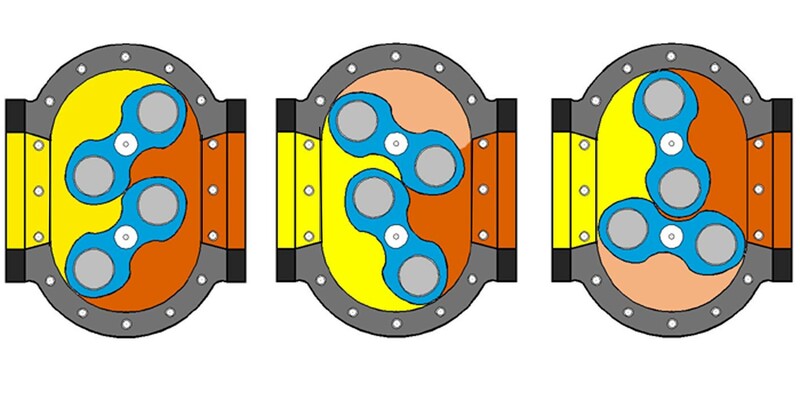 Since the lobes run within the casing with finite clearances, no internal lubrication is required. The air, thus, delivered is 100% Oil Free. These blowers deliver, practically, a constant flow rate independent of the discharge pressure conditions. The flow rate is dependent, largely on the operating speed. Due to these constructional features it has the following distinct characteristics. The temperature rise of the discharge air and machine is largely dependent on the differential pressures across it. There is no compression or change in volume within the machine but the Blower works under system back pressure conditions. To illustrate further, let us consider a case when the discharge of a Blower is connected to the bottom of a tank, having water to a depth of ‘H’ mm. 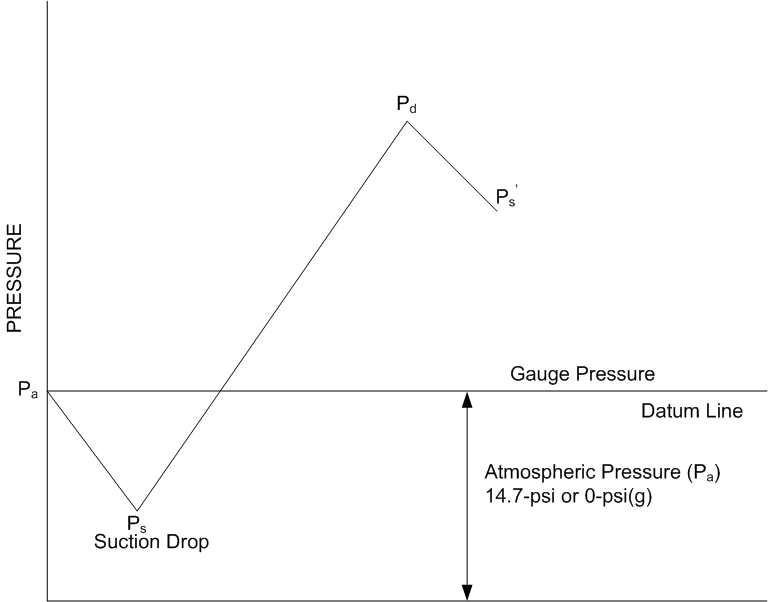 The air-discharged accumulates in the discharge line until sufficient pressure is built (slightly over ‘H’ mm of WG), when it starts to escape out. The system resistance or the static load on the Blower is thus ‘H’ mm WG. The power consumed by the blower depends upon the flow rate and the total pressure head on the Blower. Ps is the pressure at the suction port which is slightly below the ambient due to suction filter and silencer drop. Ps’ is the actual system back pressure. As seen from the curve the total work done by the Blower is to raise the pressure of inlet volume from Ps to Pd. Ideally, the blower is capable of resisting high pressures but the mechanical limitations, increased power intake, temperature rise, and increase in ‘SLIP’ restrict the working pressure head to about 9.6-psi for Air-Cooled Blowers and 14.2-psi for Water Cooled Blowers in single stage operation. It is therefore, important to ensure that the drop between Pa and Ps (Inlet drop) and Pd and Ps (outlet drop) should be as low as possible. This can be achieved by using adequate size piping and large radius bends wherever possible. The Blowers are generally selected for the maximum system pressure, which they may encounter during operation and the prime mover is selected accordingly. When in operation, the Blower offers a considerable power saving since the power consumed by it depends upon the actual working pressure under which it operates and not the rated pressure. Rotary Air Blowers are widely used in applications demanding medium pressures and relatively large flow rates. Water Treatment Plants: For back-washing of filter beds. Effluent Treatment Plants: For diffused aeration and agitation of effluent. Cement Plants: For Blending, Aeration, Fluidisation, and Conveying. Aquaculture: For Maintaining the dissolved oxygen level. Biogas Boosting: Transferring of Biogas from gasholder to boiler. Flocculation: To increase the removal of suspended solids in primary setting facility. Chemical Plants: For supplying of process air. Electroplating Plants: For Oil free air agitation of electrolyte to maintain uniform density. Yarn Drying: Vacuum/Pressure Drying of yarn. Reverse Jet Filters: For reverse cleaning of Filter bags. Pneumatic Conveying: Vacuum, Pressure and Combination Conveying of cereals, cement, husk, baggage, granules, powders and other similar material. A landfill site (also known as a tip, dump, rubbish dump, garbage dump or dumping ground) is a site used for the disposal of waste materials by burial. Dumping waste in this fashion is the oldest form of waste treatment. Modern landfills are properly designed and managed facilities used exclusively for the disposal of solid waste; in the United States, landfills are located, designed, operated, and monitored to ensure compliance with federal regulations. There are a few different kinds of landfills, and the type of landfill is representative of the type of waste/garbage the particular landfill will receive. For example, a Municipal Solid Waste Landfill (MSWLF) is designed to receive household and other types of non-hazardous waste. Bioreactor landfills are a type of MSWLF that operates to quickly break down organic waste. At Bioreactor Landfills, the increase in waste degradation and stabilization is accomplished through the addition of liquid and air to enhance microbial processes. Landfill Gas to Energy is also commonly known as Waste-to-Energy. Aerobic: At an aerobic bioreactor landfill, leachate (the liquid that drains or ‘leaches’ from the waste) is removed from the bottom layer, piped to liquids storage tanks, and is re-circulated into the landfill in a controlled manner. Air is injected into the waste mass using vertical or horizontal wells to promote aerobic activity and accelerate waste stabilization. Anaerobic: In an anaerobic bioreactor landfill, moisture is added to the waste mass in the form of re-circulated leachate and other sources to obtain optimal moisture levels. Biodegradation occurs in the absence of oxygen (anaerobically) and produces landfill gas. As biodegradable waste in landfills decomposes, landfill gas is released. Landfill gas consists of approximately: 50% methane, 42% carbon dioxide, 7% nitrogen and 1% oxygen compounds. Landfill gas is a readily available, local and renewable energy source that offsets the need for non-renewable resources such as oil, coal and gas. This landfill gas is then captured to minimize greenhouse gas emissions and can be used for energy projects. TMC Fluid Systems is a manufacturer and system integrator that designs and supplies blower systems to safely transport landfill gas either to flares for burning, or to other equipment (example gensets and or boilers) that can utilize this landfill gas to generate heat or electricity or both. The temperature rise in air discharged is largely dependent on the working pressure. Blower Selection: The right selection and installation of an air blower can result in substantial energy savings. For proper selection of blower, air volume and air pressure are the most important parameters. Air Volume: Is the quantity of air required generally measured in m3/hr (or cfm). It is the total air requirement of the plant and depends on the plant capacity or the quantity of water to be aerated. Detailed calculations are needed to establish the required air flow rate, based on initial oxygen levels, final oxygen levels desired, BOD demand, and oxygen transfer efficiency, etc. However, as a rule of thumb, air requirement per 100-tons of water can be taken as approximately 100-m3/hr for medium pore diffusion aeration systems (i.e. using stones). Accordingly, the total air requirement can be calculated based on the total quantity of water that needs to be aerated. Air Pressure: Is the minimum air pressure required to enable air to bubble through the water, through the immersed stones, after overcoming the total pipeline pressure drop from where the blower is mounted and installed all the way to the diffuser tank. Power: The power consumed by the blower is directly proportional to the air pressure. Consequently, pipe sizing and installation, system resistance, pressure drop across valves and elbows and bends should be adequately addressed. A systematic step-by-step checklist can be made to establish the cause for excessive back pressure and the same should be corrected to optimize power consumption. High discharge air temperature is also an indication of excessive differential pressure across the blower. There is no compression or change in volume within the blower. Instead, the blower works under system back pressure conditions. To illustrate further, let us consider a case when the discharge of a blower is connected to the bottom of a tank with a water depth of ‘H’-mm. The air discharged out of the blower accumulates in the discharge line until sufficient pressure is built (slightly over ‘H’-mmWG), when it starts to escape out. The system resistance or the static load on the blower is thus ‘H’-mmWG. The power consumed by the Blower depends upon the flow rate and the total pressure head on the Blower. A Blower is capable of resisting high pressures but the mechanical limitations arising due to increased power intake, temperature rise and increase in ‘SLIP’ restricts the working pressure head. The Blowers are generally selected for the maximum system pressure which they may encounter during operation and the prime mover is selected accordingly. When in operation, the Blower offers a considerable power saving since the power consumed by it depends upon the actual working pressure under which it operates and not the rated pressure. Consider a case when Twin Lobe Rotary Air Blower is selected for an application requiring a capacity of “Q”-m3/hr at “H”-mm of WG at which the power is specified as “P”-KW. Under the rated conditions it would consume “P”-KW, but if the system back pressure falls from the rated/design value, the Blower automatically starts working under lesser head and power requirement falls accordingly. These salient features make Rotary Air Blowers a versatile machine. They are ideal for applications requiring Constant Flow Rate at Varying discharge Pressures. All living beings require oxygen for their existence. Creatures of land take this vital element from air whereas water creatures take it from the water source they live in. The natural biological and physical factors constantly maintain balance by replenishing the loss of oxygen thru natural means. The dissolved oxygen values in water depend upon the interaction of biological and physical factors. The biological factors are the quantum of fish or prawn, the amount of organic load in the form of dissolved and particulate organic material, aerobic bacterial populations and primary producers like phytoplankton and macrophytes. The physical factors are temperature, wind velocity and /or turbulence, salinity, and a balance with other gases like carbon dioxide and ammonia. While freshwater has a higher value of dissolved oxygen, in salt water it is less. As the salinity and temperature increase, the solubility of oxygen in water is affected. The concentration of dissolved oxygen follows a natural sequence in a 24-hour period. As the sun rises, the production of oxygen increases through photosynthesis. And as the sun sets, the dissolved oxygen levels fall due to respiration by plant and animal life, reaching minimum level towards the early hours of the morning. In aquaculture management, additional inputs in the form of feed and aeration facilitate the aquaculturist to increase the oxygen carrying capacity in water, leading to realization of higher yields per unit area. Thus, properly sized aeration systems have assumed great importance in the context of semi-intensive and intensive systems of aquaculture. The table below gives solubility of oxygen in fresh water, at sea level, for different water temperatures. As shown in the above table, oxygen solubility drops with an increase in temperature. Similarly, with an increase in salinity, there is a corresponding drop in oxygen solubility. For 35-ppt sea water the solubility values of the chart above would reduce by about 15%. Aeration can be accomplished by mechanical aerators or underwater air diffusers. Mechanical aerators agitate the water to produce liquid to air contact, while underwater diffusers introduce air bubbles from a depth to achieve oxygen transfer and mixing. There are a wide variety of surface aerators such as paddle wheels, pumps which spray water into the air, and several other devices. The one aspect in common with all these systems is that they all expend a great deal of kinetic energy in throwing large quantities of water into the air. Obviously if the systems are expending energy in this task, the energy is not being directly used to aerate or mix the water in the fish culture system, making them power inefficient. Surface agitators often look very impressive, but their influence over the oxygen levels in the aquaculture system is rather localized to the area surrounding the equipment. This factor becomes very apparent in ponds with a water depth of more than 1-metre. When oxygen levels are measured at depth or in the sediment, very low levels of oxygen are recorded. The low dissolved oxygen levels may lead to anaerobic sediment conditions and deterioration in water quality. Bubble type aeration systems are replacing many mechanical aerators because of their low maintenance, high reliability, safety, flexibility and higher oxygen transfer efficiency. They are better at removal of waste gases such as ammonia and carbon dioxide. In this arrangement atmospheric air is pushed through water using diffusers, which causes the air to bubble and rise to the surface of the water – and in the process, the oxygen transfer takes place. Diffusers are designed to deliver either coarse (approximately 4-6-mm), medium (approximately 2-3-mm), or fine (approximately 1-mm) air bubbles. Coarse-bubble systems require the lowest air pressure and are very resistant to clogging, but are about one third as efficient as medium bubble systems in transferring oxygen to the water. The medium bubble diffuser requires only slightly higher air pressure, but it’s has superior oxygen transfer. The fine-bubble diffuser’s superior oxygen transfer usually does not compensate for its higher-pressure requirement and much more frequency clogging. Fine bubble diffusers, therefore, are typically chosen for pure oxygen or ozone systems where pressure requirements are usually less important than transfer efficiency. Overall, however, medium-bubble diffusers are the most popular among aquaculturists. Drilled PVC-type (Coarse bubble aeration) Primarily for agitation, de-icing, prevention of Sludge Settling Low oxygen transfer rates. Medium Pore Diffuser using stones made of glass bound silica General aeration in hatcheries Medium Diffuser transfer rates. Approx. bubble size 1-3- mm. Fine bubble Diffusers – Rubber membrane type Pure gas applications. For high stocking density areas like in storage/ transport tanks, emergency aeration High Oxygen transfer efficiency. Flow rate = 0.2–0.4-m3/hr per cm2 of membrane area. Conventionally, in hatcheries where multiple tanks need to be continuously aerated, the use of a centralized air blower with a distribution pipe grid is the general accepted practice. Along the distribution grid, flexible rubber pipes are connected that have ceramic diffusers/stones on the ends, immersed in tanks, through which the air is diffused into the tank. This arrangement offers a host of advantages such as centralized air supply, low installation cost, low maintenance, high flexibility, efficient oxygen transfer and easy operations. Since the intended role is very critical, high reliability and performance is of major concern. As these air blowers have to run continuously, reliability and energy efficiency is important. TMCFS Aqua Series Air Blowers are especially developed for Aquaculture applications and offer 100% Oil Free Air supply and are rated for continuous duty applications. Unlike conventional air blowers, the Aqua Series Blower has modified end plates, which are physically isolated from the lubrication chambers to ensure 100% oil free air even under worst case of oil seal failure – providing total protection to the hatchery. Over the last several years, our Project Managers, Application and Commissioning Engineers, and Service Technicians have been asked some very interesting questions. Some questions we were able to answer on the spot; on some occasions, we had to come together as a group and collaborate internally; in other instances, we had to stretch and bring in our vendors, consultants, and leading industry scientists to make sure the solutions or answer we were providing was accurate.